Rational basis for the creation of MANU® results from the observation that a moderate grip of the distal extremities of metacarpal bones, from the second to the fifth, and a concomitant extension of the thirth and fourth fingers, alleviate paresthesias and pain in Carpal Tunnel Syndrome (Manente et al. - Muscle & nerve, 1999). Efficiency and tolerability of MANU® have been proved by two randomized controlled studies (Manente et al. - Muscle & Nerve, 2001; De Angelis et al. - Acta Neurologica Scandinavica, 2009) respectively of the duration of one and three months. 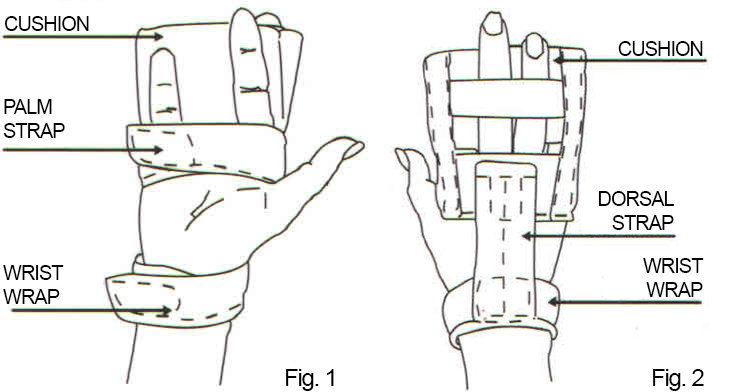 MANU® increases the available space inside the carpal tunnel (Manente et al. - Journal of Hand Surgery, 2002). MANU® is a registered European trademark. MANU® has a Europena patent, a US patent and an Italian patent. All rights are reserved to AGF Orthopaedic Devices srl - Italy. MANU® is used for assuaging the symptoms and to improve hand functionality in carpal tunnel syndrome. MANU® must be worn during the night time, repose for 1 - 3 months (cycle repeatable to the need). 2) MANU® efficiency and tolerability have been tested in a controlled study for three months continuous use. A longer and continuous use shall be in compliance with the physician's indications. Available sizes are S, M, L, XL both for the right hand and for the left hand. You can choose your right measure by measuring the width of your hand, that must be opened with fingers side-by-side, at 1 cm from the base of the fingers (forefinger­little finger). NOTE: In case your measure is on the limit or near the limit between two sizes, choose the smaller one.